Princeton University Art Museum exterior. Courtesy of the Princeton University Art Museum. 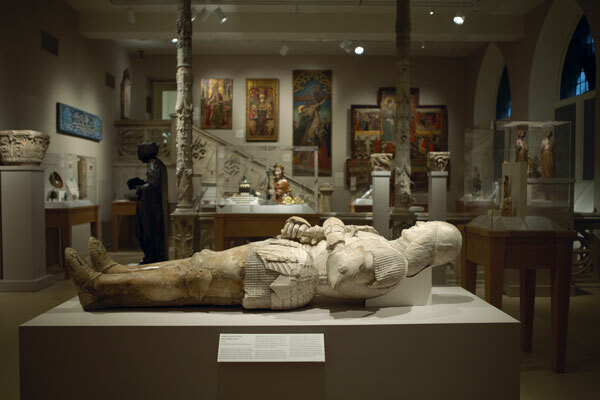 Ancient Art Galleries at the Princeton University Art Museum. Medieval, Byzantine & Islamic Art Galleries. European Art, 19th-Early 20th Century Art Galleries. 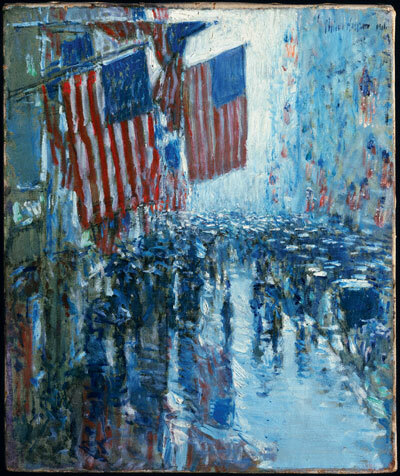 Rainy Day, Fifth Avenue, 1916, by Childe Hassam (1859–1935). Oil on canvas. Gift of Albert E. McVitty, Class of 1898. Saint Cecilia, stained and painted glass, circa 1900, Sir Edward Burne-Jones (British, 1833–1898); made by Morris & Co. Museum purchase, Surdna Fund. 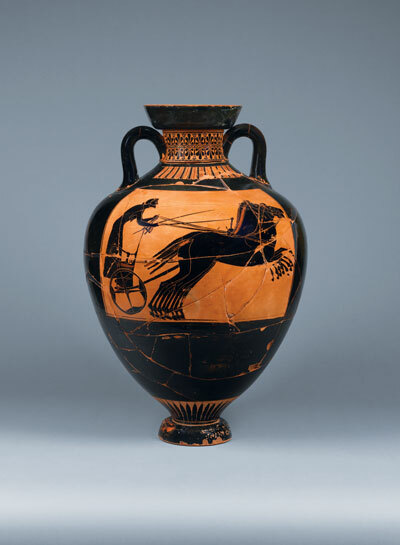 Greek, Attic style, in the manner of the Berlin Painter, Panathenaic amphora (a large ceramic vessel that contained olive oil given as prizes in the Panathenaic Games). Circa 500–490 B.C. Bequest of Mrs. Allan Marquand. The Princeton University Art Museum has the intimacy of a small institution but some of the range befitting a much larger one. When Ben Franklin called New Jersey a keg tapped at both ends, he probably wasn’t talking about art museums. But the quip would certainly apply today. Art lovers living in North Jersey flock to world-class museums in New York City, just as those in South Jersey tend to get their artistic fixes in Philadelphia. Which leaves open the question of where people in Central Jersey go. Interestingly, those living equidistant from the two great cultural metropolises have a terrific option: the Princeton University Art Museum. In fact, the museum is worth the trip for anyone in New Jersey—or anyone in those two great cities where the so-called “taps” are located. It’s a first-class institution. Its holdings number 92,000 objects. Its annual budget is the largest of any museum in the state. 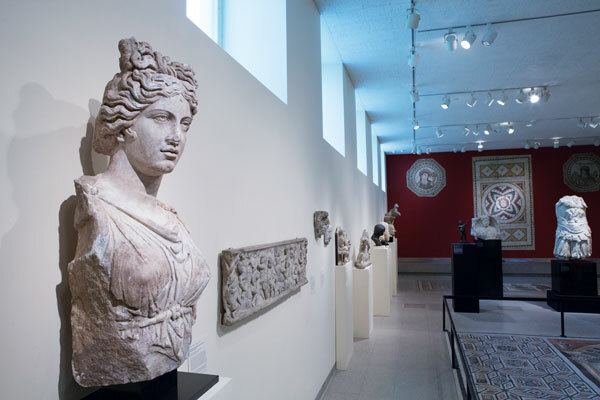 Its galleries are filled with objects that any museum would be proud to have—as evidenced by frequent loans of works to major exhibits (such as the Metropolitan Museum’s recent show on Hellenistic art). The Princeton University Art Museum has the charm and intimacy of a small museum with some of the range of an encyclopedic one. On view are canvases by Monet and Van Gogh, vases from Greece’s golden age, dreamy Chinese landscapes, medieval sarcophagi and Old Master paintings by the likes of Van Dyck, Ruysdael, Rubens and Chardin. The American collection spans works from the early Republic, including two of Washington at the battle of Princeton, Hudson River School paintings by Albert Bierstadt and Jasper Cropsey, and works of modern and contemporary art by De Kooning, Warhol and New Jersey’s own George Segal. Outside and around campus you can find monumental modernist sculptures by Henry Moore, Isamu Noguchi and Alexander Calder. Museums attached to universities are often not so much real museums as “study collections.” These exist primarily to give art history students—who are typically overly saturated with reproductions and projected images—some first-hand exposure to the objects of their study. This can be an important function. Princeton alumnus Thomas Hoving, director of the Metropolitan Museum in the 1970s, traced his awakening in art history to a class in which the professor reached into his pocket, took out a small, medieval artifact and put it on Hoving’s desk. Such epiphanies aside, the Princeton Museum over the years has evolved into much, much more than a study collection. Its roots go back to Ben Franklin’s time — he was 40 years old when it was founded in 1746. At the time the school was called College of New Jersey, and the first works to enter its collection were portraits of New Jersey Colonial Governor Jonathan Belcher and England’s King George II. These were destroyed in the Battle of Princeton in 1777. Because museums often contain such old things, we tend to think of them as old institutions. But they are not really so old. Their forerunners were the so-called cabinets (actually rooms) of curiosities dating to the 16th century. America’s first public museum was founded in Philadelphia by artist and collector Charles Willson Peale in 1786. Although he was a prolific portrait painter (his full-length portrait of George Washington is now in the Princeton University Art Museum), Peale’s museum was devoted to natural history and was the first one to display a mas­todon skeleton. The Princeton University Art Museum was formally established in 1882, just 12 years after the Metropolitan Museum of Art in Manhattan. Its first director was alumnus and lecturer Allan Marquand, whose father, Henry, was one of the founders of the Metropolitan. In 1890, the Princeton museum, which had occupied various buildings on campus, finally got its own home, a chunky Romanesque Revival structure. One of Marquand’s gifts to the museum is a 1520 painting attributed to Hieronymous Bosch, Christ Before Pilate, notable for the array of grotesque heads that surround the quiet central figure. Over the years, its directors drew on personal wealth, donations by well-to-do alumni and university funding to build the collections. Mather built up the museum’s holdings in works on paper. That collection now includes prints by Rembrandt and Picasso, watercolors by Cezanne and an American drawings collection considered one of the finest in the country. In the post-World-War II era, the museum was led by several Princeton faculty who had played an important part in salvaging and recovering European art treasures that had been stolen, damaged or hidden by the Nazis. They were among the so called “Monuments Men,” who were popularized in a recent Hollywood movie starring George Clooney, Bill Murray and Matt Damon. Museum Director Ernest DeWald had been one of these men. His hands-on approach to conservation included cleaning paintings in his office. The other Monuments Man, Patrick Joseph Kelleher, led the campaign for a new building, which culminated in the 1966 opening of the present-day International Style building, which is attached to the older McCormick Hall. The photography collection began in 1949 with the gift of Alfred Stieglitz’s The Steerage. In 1971 it was given a big boost by the gift of the David Hunter McAlpin Collection. McAlpin was an investment banker and a 1920 graduate of Princeton. In addition to his collection, he gave a monetary gift that endowed a chair in the history of photography (the first such one in the country) and made possible the photography center that bears his name. The first professor to hold that chair, Peter Bunnell, was a former curator of photography at the Museum of Modern Art who became the museum’s director in 1973. The photography collection today has 27,000 prints. The current director, James Steward, oversees a modern institution that is now digitizing its entire collection and recently issued a new edition of its 419-page catalog, Handbook of the Collections. Today, the museum’s holdings are supplemented by long-term loans such as the collection of impressionist and post-impressionist works lent by the Henry and Rose Pearlman Foundation. 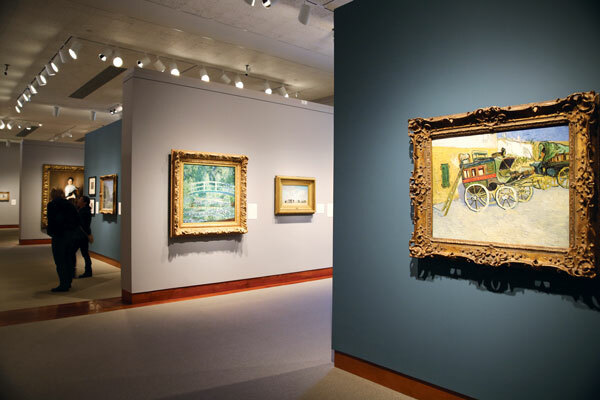 One of these is Van Gogh’s emblematic Tarascon Stagecoach (1888), from his Arles period. I’m partial to small museums, where you can see most everything before your attention is exhausted. 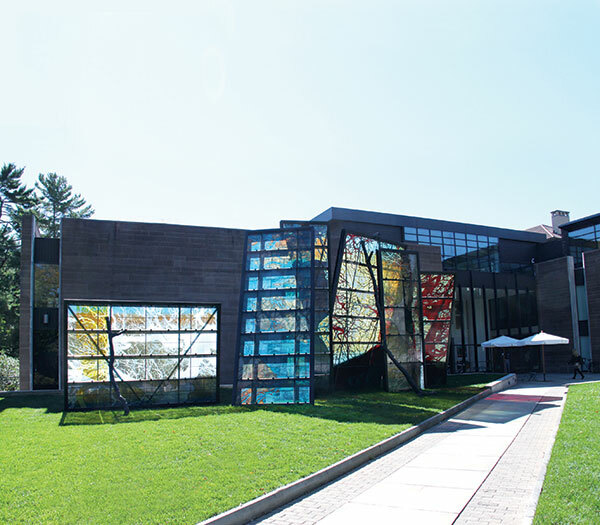 As far as small museums go, the experience of the Princeton University Art Museum is unique because you cover so much territory. It’s like the Metropolitan Museum in miniature. You can move through historic periods without becoming lost in them. You experience what Steward calls “reset” moments. You also feel more keenly the connections between periods and schools of art. Columnist John Zeaman is a freelance art critic who writes regularly for The Record and Star Ledger newspapers. His reviews of exhibits in New Jersey have garnered awards from the New Jersey Press Association, the Society of Pro­fessional Journalists (New Jersey chapter) and the Manhattan-based Society of Silurians, the nation’s oldest press club. He is the author of Dog Walks Man (Lyons Press, September 2010) about art, landscape and dog walking.